While the Tom & Jerry cartoons taught us that cats and dogs can’t live together, you’d be surprised that there are many pet owners who have both cats and dogs living in the same house and no one seems to have a problem. Many of them even wonder if cats can eat dog food and vice versa since it would be a lot easier to just buy one type of food for both. While that may seem like a good idea, know that it’s not. In fact, it’s a bad one, as cats may have troubles in the long term from eating dog food, and not because of reasons outlined by the Tom & Jerry cartoons, but because of other, health related factors. 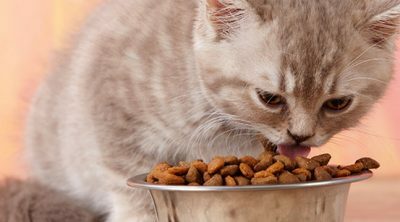 Cats eating dog food appeals to pet owners because in general, dog food is cheaper and comes in more varieties than the cat food. One other reason is that sometimes cats will steal the dog’s food, making their owners think that dog food is also a good alternative for cats. 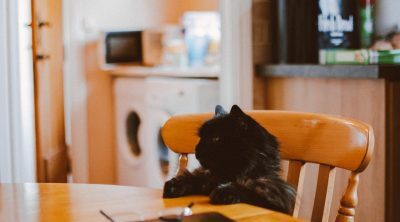 As the case is with us humans as well, not everything that seems appealing is also healthy, so even if your little feline friend steals some of your dog’s tasty treats, that doesn’t mean it’s healthy for him on the long term. 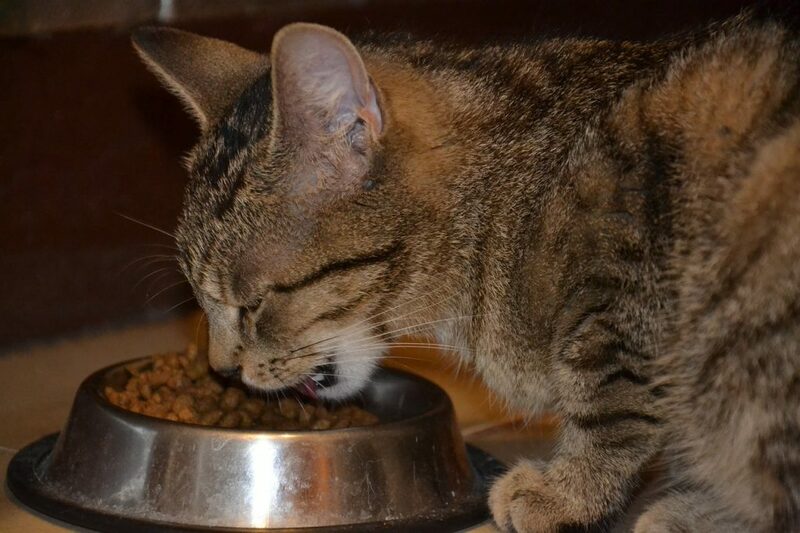 Cats and dogs have different nutritional needs, which makes their food different in all aspects. 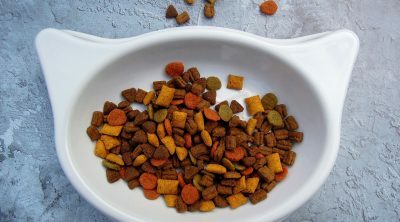 If you feed a cat on dog food for a sufficient amount of time, your cat will end up malnourished because the dog food doesn’t provide her with all the nutrients she needs. Dogs are omnivore animals so they can take nutrients from both plant based and animal based food sources, unlike a cat who’s carnivore by nature and needs animal protein to get full nutritional value from their food and have a healthy life. 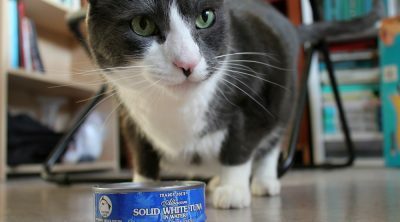 Cats, unlike dogs and humans, need a high protein diet, and since they can only take those proteins from animal based food sources, they need their special cat food. 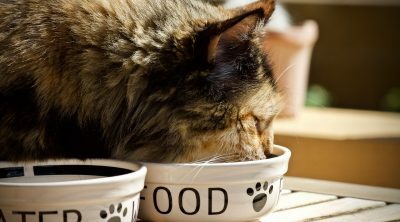 Dog food contains less protein than cat food and some of it can come from plants, which cats can’t synthesize. Cats need vitamin A, which is not supplied in all dog foods. Dogs can turn beta carotene into vitamin A, but cats can’t, so they need their special diet. There are as well amino acids which are essential for cats and cannot be found in dog food. Out of the 23 total amino acids present in animal based proteins, 11 of them are needed by cats to survive. Their bodies cannot produce them, so they need to get them from food. Taurine and arachidonic acids are two of them. Dogs can make their own, while cats need to get them from food, and since dog food may not contain them, a cat eating only dog food will soon develop certain diseases. 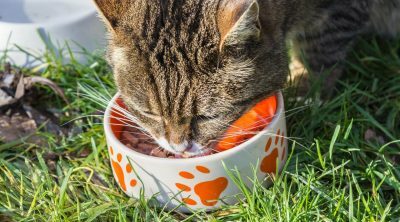 While small amounts of dog food now and then won’t harm your cat, a long term diet of dog food will, so get your little feline friend the food she needs.